Data should always inform strategy. This is something we take to heart at IWCO Direct. In fact, it’s something I have written about in past blog posts. But what else goes into a sound direct marketing strategy, and perhaps more importantly, how is it defined? According to BusinessDictionary.com, an organization’s marketing strategy “…combines all its marketing goals into one comprehensive plan. A good marketing strategy should be drawn from market research and focus on the right product mix in order to achieve the maximum profit potential and sustain the business. The marketing strategy is the foundation of a marketing plan.” In other words, a marketing strategy must be based upon measurable goals and drawn from research. I like to approach it with the mindset that you can’t reach a goal you don’t set. You also can’t reach a goal you are unwilling to pay for. In short, you need to know what you want to accomplish. Define the plan to accomplish it, and fund the plan accordingly. If I were to pick one or two areas where most companies fall short in their strategy, it would be in research or in the alignment of key customer benefits to the appropriate target audience. Too often it seems the company is attempting to force a product to fit an audience or is unwilling to retool the benefits of a product to fit an audience. Companies should avoid making decisions on yesterday’s data and should look instead at the historical behavior of prospects as they became customers, along with quantitative and qualitative research. It takes a reasonable understanding of the competition, what they have to offer and how they are offering it to the market in order to craft messaging that stands out in the marketplace. It’s important to “zig when they zag” and avoid putting out a “me too” message. 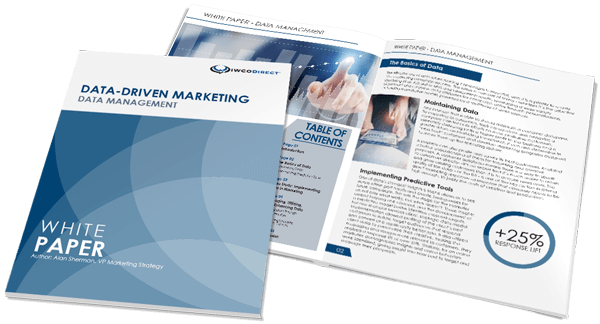 Our initial dialogue with a customer or prospect includes a robust discussion based on a series of questions designed to help us understand how we can improve their current or proposed direct marketing efforts. This is typically an informal process, something we call an acquisition process audit or onboarding questions. This process helps us more fully understand the marketing problem that we are asked to solve. What is the biggest customer benefit that your product or service offers? Who is the ideal buyer? What have you done to market this product so far? What is your average cost per acquisition? Do you have a budget for this campaign effort? What are your goals and key performance indicators (KPIs) for this campaign? Discovering where the opportunity for improvement lies starts with asking the right questions. By asking these questions and pouring over the historical results, we look for something I like to call “the gap” in the marketing process. This identifies what causes response to be less than what it could be. It could be the offer or the message. It could be the way the offer is positioned or presented to the prospect. It could be the creative piece or the audience that the piece is mailed to. It takes a fairly robust dive into what is being sold and what has been done to market the product or service so far to determine how to improve the current marketing effort, or the current direct mail campaign in particular. The most effective marketing campaigns are brilliant communications that promote a product or service with benefits that a specific target audience is genuinely interested in. In order to align the benefits, offer and message with the audience, you must first understand the audience. You need to know who they are and what makes them tick, which, again, takes a serious commitment to research. To really win in today’s market, I believe you need a strong value proposition that stands out from the competition and is clearly communicated. Start by taking stock of where you are today. Mine your customer data. Survey your best and worst customers. Discover why they bought from you. Ask them what was important to them and what they wish your product did that it fails to do now. Look at your competition and learn how your product or service fits into the competitive landscape. Think about all the options your consumer has to choose from—and keep your eye on finding what they can’t find from a competitor. Once you have identified it, and you know who will find it most appealing, only then can you determine how to best communicate that benefit.